Our editors work around the clock to ensure that our clients don’t miss a thing. InfoDesk, a leading provider of business intelligence solutions, has introduced a powerful new suite of corporate intelligence solutions tailored to meet the needs of the financial services sector. Available immediately, the new suite greatly simplifies real-time content gathering and distribution, offering unlimited content options, more flexible technology and greater ease of use. To meet the changing market demands InfoDesk is offering a new suite of information integration and delivery options, including sleek financial intelligence dashboards, custom managed news services (with added human intelligence) and a wide variety of content display widgets, RSS and archive tools. According to Epstein, the financial intelligence market is “in a state of flux right now” and InfoDesk’s unique, content neutral platform offers the perfect alternative for organizations seeking new financial intelligence solutions. InfoWatch, a sleek financial intelligence dashboard, makes keeping up with financial news and competitor intelligence faster and easier than ever. 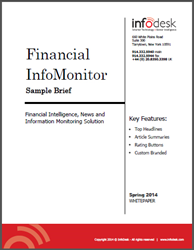 InfoWatch puts all of an organization’s most-used information resources in one place. Users can find all their industry and company news, trade publications, newspapers and press releases – all filtered just for them and all in one place. InfoWatch Dashboards also feature social media, competitor news, stock quotes and industry trends. “Our new InfoWatch Dashboard not only helps communications and information professionals do their jobs better,” said Epstein. “This dashboard helps everyone in the company keep up with the latest business news and information they need to succeed.” Learn more—Watch one-minute video. Also, InfoDesk has combined it’s technology with human intelligence to provide a custom edited InfoMonitor newsletter (managed news service) that scans and filters thousands of news sources—including all types of subscription-based content, web sites, and other sources—to deliver only the most relevant financial intelligence. Without redundancy. Many financial information users tell us “they’re being buried alive by ‘often irrelevant’ automated alerts and updates,” said Epstein. By contrast, InfoMonitor provides only hand-selected content, chosen for maximum relevancy and importance. “Our editors work around the clock to ensure that our clients don’t miss a thing,” Epstein added. Learn more—Download a complimentary sample brief. InfoDesk's other Financial Intelligence Solutions include a variety of highly flexible content display widgets, RSS and archive tools that dramatically simplify the process of content curation and distribution. “All in all, our new financial intelligence solutions pack a powerful punch,” said Matthew Rubin, InfoDesk Vice President of Sales, who recently joined InfoDesk. Previously, Rubin was Regional Sales Director at Dow Jones, where he led a team of sales professionals in the greater New York area. In that capacity, he oversaw corporate content and solution sales for many of the largest financial and corporate organizations in the world. InfoDesk (http://www.infodesk.com) specializes in cutting-edge business intelligence (BI) solutions that dramatically simplify the process of content curation and distribution. InfoDesk’s BI solutions offer unlimited content options, easy-to-use content curation tools, user-friendly dashboards, interactive newsletters, and managed news services, as well as host of other highly customizable solutions. For more than 14 years InfoDesk has helped some of the largest multinational corporations, top government agencies and media companies maximize their information resources. InfoDesk is based in Tarrytown, NY with offices in London and Washington DC.